«... a remarkably talented newcomer by the name of Susanne Mebes has put out quite the sleeper. Her Ponce is simply the most enjoyable I've heard this side of Segovia. Grace and expressivity abound, while her sense of balance and clarity is matched only by Williams and Korhonen. 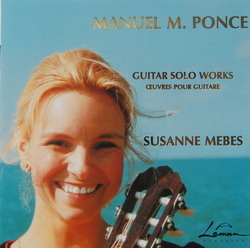 Furthermore, this Dutch girl makes Ponce sound very idiomatic on the guitar, which he wasn't always, even with Segovia nipping at his heels. «... (the recording) allowing Mebes's technique and tonal production to bloom naturally. And bloom it does.